The bed was good and the TV was good and worked well. HVAC was efficient. Reasonably quiet -- no noise from adjacent rooms, and highway noise was negligible. Comfortable room with a wonderful staff that went out of their way to make my stay wonderful! This property is dated and needs repair. That being said it was clean, bed was comfortable as were the pillows. We were traveling and just wanted a good nights sleep. We had some trouble with the TV and the manager came quickly to the room and fixed it. We had our small dog with us and that tacked on a $10 fee (20% of room charge). Room was comfortable, clean, and quiet. Free wifi. Very considerate, an iron, hair dryer, king size bed, comfortable. Western Motel This rating is a reflection of how the property compares to the industry standard when it comes to price, facilities and services available. It's based on a self-evaluation by the property. Use this rating to help choose your stay! One of our best sellers in Deming! 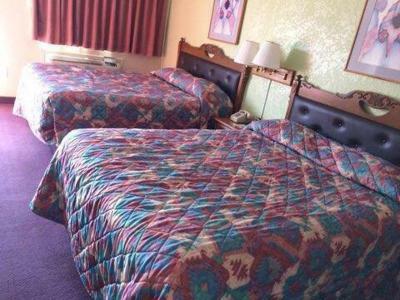 Located in Deming, Western Motel features barbecue facilities, garden and free WiFi. 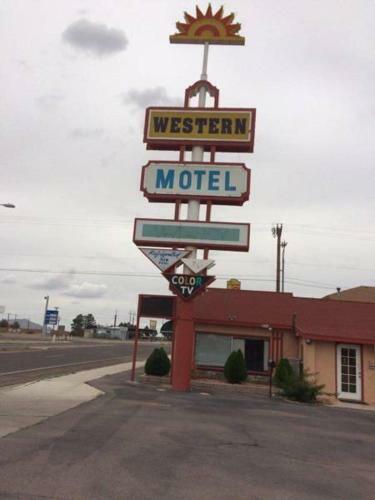 This 2-star motel offers a 24-hour front desk and a business center. Rooms are equipped with a flat-screen TV with satellite channels. At the motel, all rooms include a desk. The private bathroom is equipped with a shower and a hair dryer. Guest rooms will provide guests with a microwave. The nearest airport is Grant County Airport, 37 miles from the property. When would you like to stay at Western Motel? House Rules Western Motel takes special requests – add in the next step! Western Motel accepts these cards and reserves the right to temporarily hold an amount prior to arrival. Horrible staff. Dirty rooms lots of stains on walls. Needs to be big time cleaned up. Ice maker did not work; no ice! Cheapest, thinnest toilet paper we had ever experienced! Bathroom floor was a bit sticky, despite otherwise clean setting. We had indicated a pet in our booking, but Western did not seem to have noted that, and they charged us extra when we checked in; they did, however, 'work with us' on the additional fee. The tee pee was horrible but if that's what it takes to keep the price down I'm ok with it. Next time I will bring my own. The cost felt like a waste no accommodations for wat was paid. Awesome stay. Very nice staff. Close to freeway.
. Did not have any problems. Whole motel looked very shabby/run down, much of which could have been fixed just by painting it. Paint was coming off the walls in the bathroom. Owners did not seem to have much idea about guests who booked on line and had not checked or printed off details of my advance reservation (which much better motels had done) and therefore had a hard time trying to find it on their phone (they need to invest in laptop or PC), they were not very friendly, did not appear to know what they were doing, were very hard to understand. The bed was OK, room had mirco-wave and refrigerator, everything worked. I could park right outside my door.